On May 3, 2017, the railroad firm Lineas, formerly B Logistics, presented its first locomotive of the Lineas fleet in the new design with the typical Railpool blue on the roof vents. In the meantime, Lineas has connected destinations in France, Germany, the Netherlands, and naturally Belgium with the slogan "Your Freight Force". Prototype: Class G 2000 BB Vossloh heavy diesel locomotive with symmetrical cabs. French State Railways (SNCF) locomotive, assigned to the freight service area Fret Benelux. Light gray/green basic paint scheme with umbra gray frame. Locomotive road number 1616. The locomotive looks as it did around 2010. Model: The locomotive has an mfx+ digital decoder and extensive sound and light functions. It also has controlled high-efficiency propulsion with a flywheel, centrally mounted. All 4 axles powered by means of cardan shafts. Traction tires. The triple headlights and dual red marker lights change over with the direction of travel, will work in conventional operation, and can be controlled digitally. The headlights at Locomotive Ends 2 and 1 can be turned off separately in digital operation. When the headlights are off at both ends, the double "A" lights are on at both ends. The cabs have lighting and it can be controlled separately at both ends in digital operation. Maintenance-free warm white and red LEDs are used for the lighting. The locomotive has many separately applied details. The side handrails on the frame are constructed of metal. The locomotive has detailed buffer beams. Brake hoses that can be plugged into the end of the locomotive are included. End covers are included and can be mounted on the buffer beam. Length over the buffers 20 cm / 7-7/8". This model can be found in a DC version in the Trix H0 assortment under item number 22922. Prototype: Belgian State Railways (NMBS/SNCB) class 82 (former 56.2-8) steam freight locomotive. Moss green / black basic paint scheme. Tender with additional boards for the coalbunker. Locomotive road number 82.002. The locomotive looks as it did in Era III. 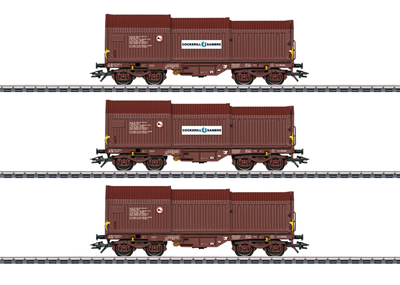 A freight car set with 2 "Oppeln" type freight cars to go with this locomotive is being offered in the Märklin H0 assortment under item number 48832 as well as a freight train baggage car under item number 46984. Prototype: Three different Belgian State Railroad (SNCB/NMBS) type Shimmns four-axle telescoping covers cars. Brown basic paint scheme. Model: All of the cars have fixed end walls and three telescoping covers. The cars' interiors have five load cradles with adjustable restraint arms. Three coils are included for each car. The cars have type Y 25 trucks. All of the cars have different car numbers and are individually packaged. There is also a master package. Length over the buffers per car approximately 13.8 cm / 5-7/16". DC wheelset E700580. A diesel locomotive to go with this car set can be found in the Märklin H0 assortment under item number 37277. A freight car set to go with this car set can be found in the Märklin H0 assortment under item number 46873. Prototype: Belgian State Railways (SNCB/NMBS) class 53 diesel locomotive. Version with four lamps at the ends, electric brakes, and without a heating boiler. Green paint scheme with yellow stripes. Road number 5319. Model: The locomotive has an mfx+ digital decoder and extensive sound functions. It also has controlled high-efficiency propulsion, centrally mounted. 4 axles powered by means of cardan shafts. Traction tires. The dual headlights and dual red marker lights change over with the direction of travel, will work in conventional operation, and can be controlled digitally. The headlights at Locomotive End 2 and 1 can be turned off separately in digital operation. The cab lighting can be controlled digitally and changes over with the direction of travel. The switching range can be controlled digitally along with the switching lights. Maintenance-free, warm white and red LEDs are used for the lighting. The locomotive has separately applied metal grab irons. The engineer's cabs have interior details in relief. Length over the buffers 21.7 cm / 8-1/2". Freight cars to go with this locomotive can be found in the Märklin H0 assortment under item numbers 46873 and 46874. Prototype: Belgian State Railroad (SNCB/NMBS) Eurofima design type AI6 compartment car, 1st class. The car looks as it did around 1979. Model: The minimum radius for operation is 360 mm / 14-3/16". The car has an underbody specific to the car type. It also has Fiat type Y0270 S trucks without lateral motion shock absorbers and without magnetic rail brakes. The 7319 current-conducting couplings or the 72021 current-conducting close couplers, the E73400/73401 lighting kits, the 73406 pickup shoe, and the 73407 marker light kit can be installed in the car. A set of decals with car routing signs is included. Length over the buffers approximately 28.2 cm / 11-1/8". DC wheelset E700580. Prototype: Belgian State Railroad (SNCB/NMBS) Eurofima design type BI6 compartment car, 2nd class. The car looks as it did around 1979. Prototype: 3 Belgian State Railways (SNCB/NMBS) type "Klagenfurt" two-axle high side gondolas. Moss green basic paint scheme. One (1) double door on each side and truss rods. The cars look as they did at the beginning to the middle of the Fifties. 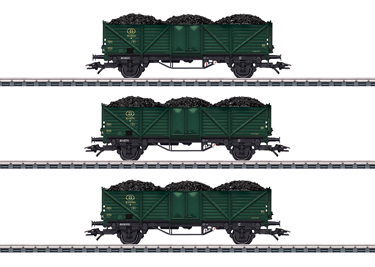 Model: Inserts of real scale-sized coal are loads for all of the cars. The cars are lightly weathered. All of the cars have different car numbers, are individually packaged, and have a master package. Total length over the buffers 35.0 cm / 13-3/4". DC wheelset per car E700580. The class 82 steam freight locomotive to go with these cars can be found under item number 37517 in the Märklin H0 assortment. 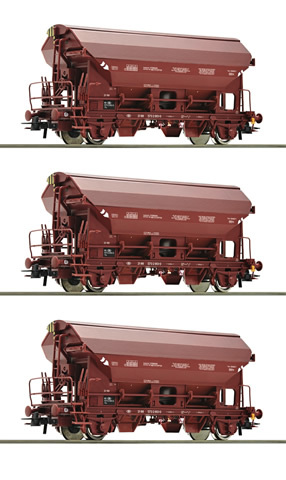 In addition, the 48832 boxcars and the 46984 freight train baggage car can be added to the freight train. Prototype: Type Sggrss 80 6-axle double container transport car with articulation, for combined freight service. Reddish brown basic paint scheme. Privately owned car for the firm Touax, registered in Belgium. Loaded with two (2) 40-foot box containers. The car looks as it currently does in real life. Model: The car has prototypically partially open flat car floors constructed of metal with striking "fish belly" side sills. It also has type Y 25 trucks. Both flat car halves are mounted on the center truck and can pivot. The underside of the flat car floors has separately applied brake lines and air tanks. There are folding walkover plates on the upper side of the flat car floors above the center truck in the area of articulation. The grab irons on the ends of the car and switching hooks are separately applied. The car is loaded with two (2) 40-foot box containers that can be removed. Length over the buffers 30.7 cm / 12-1/16". DC wheelset E700580. Modern freight electric locomotives in the classes 152, 185, 189, or 193 to go with this car can be found in the Märklin H0 assortment. Additional double container transport cars to form unit trains can be found under Märklin item numbers 47805, 47806 as well as Trix item number 24802. Prototype: Type Ghs Association Design "Oppeln" boxcar. Short version, without a brakeman's cab and without a brakeman's platform. Here as a privately owned car for Coca-Cola®, used on the Belgian State Railways (SNCB/NMBS). With advertising lettering. Car number 257586. The car looks as it did in Era III. Model: Length over the buffers approximately 10.4 cm / 4-1/8". DC wheelset E700580. Prototype: Belgian State Railways (SNCB/NMBS) class 54 NOHAB general-purpose diesel locomotive. Diesel electric Europa locomotive from the cooperation of GM/NOHAB/AFB. Model: The locomotive has a motor with a bell-shaped armature. Both trucks powered. The locomotive has new prototypical truck side frames. It also has white LED headlights that change over with the direction of travel. The locomotive has dark wheel treads. The body is made of plastic filled with metal for improved pulling power. Length over the buffers 88 mm / 3-7/16". In 1919, the Swiss industry delivered four test locomotives for various uses to be selected as suitable units for electric operation on the Gotthard. At that time, a distinction was still made for electric locomotives among freight, express, and passenger units. Standardized locomotives in the present sense did not exist yet. The Swiss Locomotive and Machinery Company (SLM) provided the mechanical part on all four locomotives, while the Machinery Company of Oerlikon (MFO) was responsible for the electrical part on road numbers Be 4/6 11301 and Be 3/5 11201. BBC of Baden provided that part on road numbers Be 4/6 11302 and Fc 2x3/4 (later road number Ce 6/8I) 12201. Road number 12201 (later 14201) was a 2-6-6-2 freight locomotive taking specifically into account the route characteristics on the Gotthard. It could pull a maximum load of 860 metric tons on a grade of up to 1.2%. Its locomotive body rode on two three-axle power trucks, each of which was driven by two traction motors by means of jackshafts, driving rods, and side rods. Originally planned only as a six-axle unit, the electrical part turned out to be so heavy that two additional pilot wheel sets as well as small hoods became necessary. Due to these hoods, the unit was quickly given the nickname "Köfferli-Lok" / "Little Suitcases Locomotive", but "Schlotterbeck" or (approximately) "Shuttering Tank" also gained popularity due to its rough riding. On July 7, 1919, road number Fc 2x3/4 12201 was delivered as the fourth and last test locomotive and was initially tested from the Bern Depot. After a relatively long trial period, it went into regular scheduled use in December of 1919 between Bern and Spiez pulling passenger and freight trains. In March of 1921, it was moved to the Gotthard, where it ran along with the Ce 6/8II (Crocodile) in the latter's schedules from the Erstfeld Depot. Starting in 1925, it was based at the Biasca Depot and did mostly pulling work until 1930 to Airolo at the south portal of the Gotthard Tunnel. After another interval at the Erstfeld Depot, it went in 1938 to Basle having proved itself in heavy freight train service. With increasingly scarce use being made of it by 1967, it was pulled from normal service. As an historic one-of-a-kind, however it was in line for preservation and was assigned to the Bern Depot for brake testing. A brilliantly executed overhaul of the running gear in 1968 at the main shops in Yverdon suddenly gave this veteran better running characteristics than ever before. After a running performance of around 2,500,000 kilometers / 1,562,500 miles, this locomotive was finally retired at the end of May 1982 as the last Gotthard prototype. Prototype: Swiss Federal Railways (SBB) class Fc 2x3/4 "Köfferli" / "Little Suitcases" electric freight locomotive (later class Ce 6/8 I). Version when it was first delivered. Dark brown basic paint scheme with black running gear. With older design buffers, cab doors without windows at the ends of the locomotive, and with walkover plates, with sanding equipment, without an oncoming train light, and without an inductive magnet. Road number 12201. The locomotive looks as it did at the middle to the end of 1919. Model: The locomotive has an mfx+ digital decoder and extensive sound and light functions. It also has controlled high-efficiency propulsion with a flywheel, centrally mounted. 3 axles and a jackshaft powered in each truck by cardan shafts. Traction tires. The locomotive frame is articulated to enable the locomotive to negotiate sharp curves. Triple headlights and 1 white marker light (Swiss headlight / marker light code) change over with the direction of travel, will work in conventional operation, and can be controlled digitally. When the locomotive is running "light" the lighting can be changed to 1 red marker light. The headlights at Locomotive Ends 2 and 1 can be turned off separately in digital operation. The locomotive has the double "A" light function. The cab lighting and engine room lighting can be turned off separately in digital operation. Maintenance-free warm white and red LEDs are used for the lighting. This locomotive is highly detailed metal construction with many separately applied details, such as cooling pipes for the transformer oil. The cabs and engine room are modelled. Sanding equipment is included on the groups of driving wheels. The roof equipment is detailed with heating resistors, roof conductors, insulators, and roof walk boards as well as double-arm pantographs with a simple contact strip. The minimum radius for operation is 360 mm / 14-3/16". Brake hoses, imitations of prototype couplers, and access ladders are included. Length over the buffers 22.1 cm / 8-11/16". A freight car set to go with this locomotive can be found under item number 46520 in the Märklin H0 assortment. This model can be found in a DC version in the Trix H0 assortment under item number 22968. With many separately applied plug-in parts that are partially etched. Engine with flywheel, drive on all four axles, one axle features traction tyres to increase traction power, LED headlight that changes automatically with the direction of travel, PluX22 interface, coupler pocket according to NEM 362 standards and close coupling mechanism. 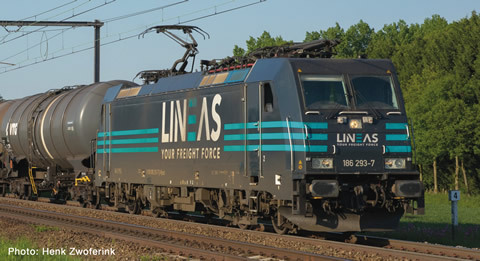 The Belgian company “Lineas” was founded in 2017 as the 100th subsidiary of the Belgian State Railways (SNCB). In the past, SNCB operated its logistics division under various brand names such as “B Cargo”, “SNCB Logistics” or “B Logistics”. Today, “Lineas” operates various locomotive series. The multi-system locomotives of the 186 series with their eye-catching design are also used in the neighboring foreign countries. 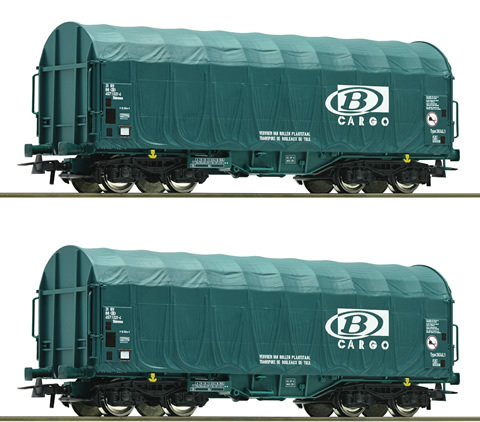 2 piece set with slide tarpaulin wagons of the Belgian National Railways. 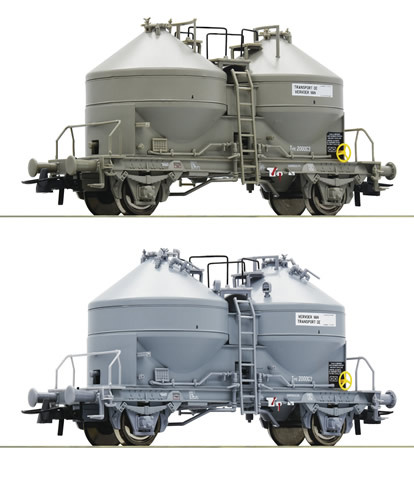 2 piece set with silo wagons, type Ucs, of the Belgian National Railways. 3 piece set with swing roof wagons, type Tds, of the Belgian National Railways. Slide tarpaulin wagon, type Shimmns, of the VTG operated by the Belgian National Railways. Open goods wagon, type Tow, of the Belgian National Railways. Stake wagon, type Rs, of the Belgian National Railways loaded with a 45 ft Container. Stake wagon, type Res, of the Belgian National Railways.